Sinevibes Singularity: it'll repeat on you. 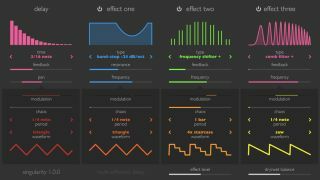 It may be called Singularity, but Sinevibes' new multi-effected delay is the latest in a long line of Mac Audio Unit plugins from the company. The chain starts with a tempo-synced feedback delay line that offers true stereo panning, with the tail being fed to three further effect processors that are connected in series. Each of these offers a variety of algorithms, including filters, phasers, choruses, digital- and analog-style distortion, a frequency shifter and a granulator. There are also four modulation generators that are designed to help you create "sophisticated, out-of-this-world delay and echo effects". Sporting the familiar Sinevibes high-contrast, colour-coded interface, Singularity is available now in 32/64-bit Mac AU formats priced at $39. You can buy it or download a demo at the Sinevibes website.